For the next fifteen years, the farthest Rick ever ventured from the park was an occasional trip to the nearest movie theater, seventy-five miles away in Cody. He never missed another day watching wolves. If he did skip a day, who knew what he might miss? The celebrated primate researcher Jane Goodall didn’t even have a college degree when she was assigned to watch chimpanzees in Tanzania, Rick liked to remind people, yet she was the first to record them using twigs as tools for fishing termites out of the ground, a discovery that upended the conventional understanding of primate intelligence. She had been in the field for months, much longer than any other observer, before she witnessed that startling behavior. And yet if you had approached her the day before she made that discovery and asked her if a chimp was smart enough to use a tool to get what it wanted, she would have said no. It was all about showing up. 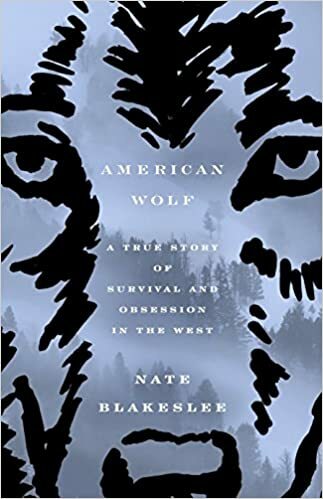 In many ways, Rick McIntyre is the focus of Nate Blakeslee’s most recent book on Yellowstone wolves, American Wolf: A True Story of Survival and Obsession in the West. McIntyre, a National Park Service employee, voluntarily spent tens of thousands of hours following wolf packs in Yellowstone National Park. He witnessed the impact of U.S. Fish and Wildlife policies on wolf conservation. McIntyre’s favorite was O-Six, an alpha female with a knack for leadership. Of all the wolves chronicled in American Wolf, O-Six receives the most attention. Unlike his colleagues, McIntyre was not a trained biologist. He just had an enormous passion for wolves. Blakeslee does a great job communicating McIntyre’s passion to the reader. Even when he was working in the Visitor’s Center near the Old Faithful geyser and far from wolf territory, McIntyre still made time to check up on his packs. Every morning, before work, he would drive 1.5 hrs. to and from the Lamar Valley. Soon, word went around that McIntyre was the “wolf-man”, even though he was not officially in charge of wolf conservation at the park. Visitors joined him in his daily routine. Passion is very underrated in business and life. Yet, passionate people are some of the most successful precisely because they go above and beyond expectations in what they do. Passionate people have the internal motivation to push through setbacks and failures. McIntyre and his wolf-watching friends drove through the heaviest of snow storms in order to keep up with their favorite wolves. When the wolves were removed from the Endangered Species list in Wyoming, McIntyre’s passion inspired policy makers to reconsider anti-wolf legislation. Although he was never directly involved in politics, McIntyre inspired park visitors to care about the recently-introduced Yellowstone wolves. American Wolf re-confirmed my belief in the importance of passion. It is, as McIntyre told a group of visitors, all about “showing up”. This doesn’t mean that a passionate person never works a day in her life. Even if you love what you do, work is still work. McIntyre’s wolf observations were not always “fun”. I’m sure most sightings were pretty mundane. But he knew that the only way to keep up with the packs was to show up regularly. Finally, passion is contagious. A person who has passion for something will naturally spread that passion to others. Many businesses and schools focus on competence and talent. They want to know about your educational background and work history. All of these things are certainly important. But nothing trumps passion. Even if you are not in a career that you enjoy, never abandon the activities that you are passionate about. If you have passion, others will care and you will see results. The story begins with Miyax, an Alaskan Eskimo, who is attempting to join a wolf pack. She is stranded in the wilderness and depends on the wolves to find food. Amaroq is the leader of the pack. He is naturally the most majestic of the wolves and the one with whom Miyax establishes a spiritual connection. She names another wolf Kapu because he reminds her of her father Kapugen, the person who taught Miyax so much about the natural world. She is running away from an oppressive and frightening past. In a letter addressed to Miyax, her Gussaq (means ‘White’ in Eskimo) pen pal Amy had offered her a place to stay in San Francisco. But she got lost in the Alaskan wilderness, and to survive, Miyax must turn to her Eskimo heritage for guidance. Julie of the Wolves by Jean Craighead George explores the boundaries that divide the tame from the wild, the traditional from the modern, and one culture from another. I love wolves. This should come as no surprise since this is the second book I have read this year about wolves (the first was The Call of the Wild). There are, in fact, quite a lot of similarities between the two works even though the story lines are vastly different. In Julie of the Wolves, Miyax is the protagonist but the story is just as much about her as about the wolves she lives with. In The Call of the Wild, Buck is the protagonist, but once again, the humans are important players in the narrative. The tone as well as some of the themes of the two stories are also quite similar. (Both, for example, speak about “the call” of the wild.) I was surprised by the sometimes blunt realism in Julie of the Wolves. One scene in particular has placed this work on a list of the 100 most frequently challenged books in America. 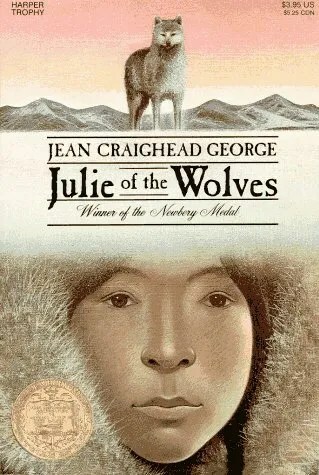 Jean Craighead George offers a pretty convincing tale about a runaway Eskimo girl living with wolves. While the author clearly loves the natural world, the story is (for the most part) grounded in reality. No culture is purely good or purely evil, and the wilderness is not an idyllic paradise. My only criticism is that at times, I found it hard to believe that it was possible for a person to develop such a tight friendship with wild and fully-grown wolves. George clearly had an understanding of the “language” of wolves, but Miyax makes a lot of physical contact with the animals and doesn’t ever get injured. Despite this minor criticism, I am definitely in agreement with the committee that awarded the Newbery Medal to Julie of the Wolves in 1973.